What stood out the most about the NHL’s summer of 2018 was the number of big-name players that ended up changing teams, with John Tavares bolting from the Islanders to join the Maple Leafs in free agency, while the Senators finally made the franchise-altering trade to send Erik Karlsson to the Sharks. This was far from “business as usual” around the NHL because these are the types of players — superstars still in the primes of their careers — who tend to stay with their team for the long haul. We do not usually see players like this change teams. For one, teams know the importance of franchise players, and they will usually go out of their way to keep them through their peak years no matter the cost, whether it be in terms of dollars or what other players around the edges of the roster they might have to trim in order to fit them under the salary cap. When big-name players do change teams, it tends to be when they’ve hit the downside of their career. Occasionally we will see a P.K. Subban or a Taylor Hall get moved, but it’s not common. Even so, these moves were just … different than what we are used to in the offseason. In Karlsson, we are talking about a player who, when healthy and on top of his game, might be one of the five best players in the world. Following Ottawa’s stunning run to Game 7 of the Eastern Conference finals, a strong argument could have been made that he was the third best player in the world based on his level of play and his overall impact, behind Connor McDavid and Sidney Crosby. That statement might still be true. From an offensive standpoint, he is perhaps the most impactful defender the league has seen since the days of Bobby Orr. Since entering the NHL at the start of the 2009-10 season, he has 96 more points than any other defender in the NHL, even though he has only played in 627 games during that stretch (the No. 2 player on the list, Keith Yandle, has played in 706). He is one of just 13 defenders in league history to win at least two Norris Trophies. Out of that group, only six of them were traded at any point in their career, and only a handful of them were traded in the prime of their careers. Chris Chelios and Paul Coffey were both dealt in their mid-20s, as was Rod Langway (before he won either of his Norris Trophies). But other than that? We’re talking about players like Doug Harvey, Ray Bourque and Pierre Pilote who were eventually traded in the twilight of their careers when they were shells of their former selves. The move of Karlsson is different, and accelerates what is already a massive rebuild in Ottawa. 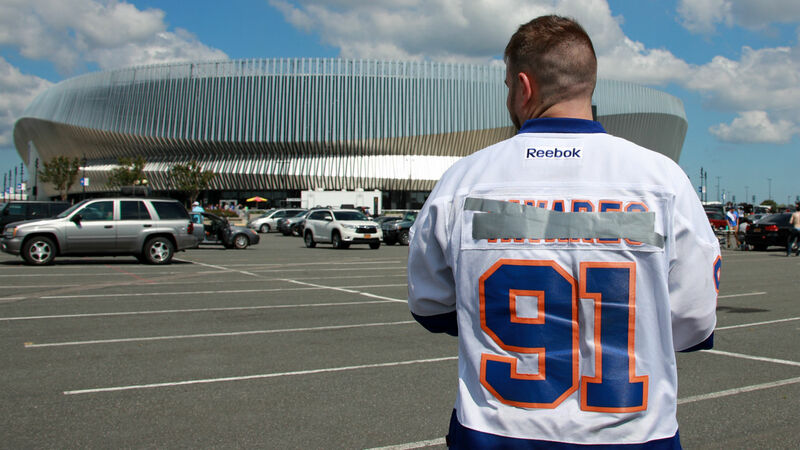 Then there was Tavares. He is a top-10 offensive player across the board, and just turned 28 years of age. Even though he may not still be at his “peak” in terms of his age, he should have seven or eight really strong years ahead of him. His production may drop a bit, but it is still going to be great. It is incredibly rare for a player of that caliber to ever hit the free agent market, let alone change teams. The best, most recent example was probably Zach Parise leaving New Jersey to go to Minnesota following the 2011-12 season, but even that isn’t a perfect parallel because Tavares is more valuable than Parise was. Not only does Tavares play a more premium position, but while Tavares has been a top-10 scorer over the past five years, Parise was more in the top-30 range when he left New Jersey as a free agent. Still an outstanding player, still a top-line forward, but still a tier below the player Tavares has been. With both teams losing the player that has been the face of their franchise for the better part of the past decade, let’s take a look at which organization stands the best chance of recovering sooner. For both teams each departure is just part of what has been — and will be — significant overhauls. Along with trading Karlsson, the Senators have also dealt Kyle Turris, Mike Hoffman and Derick Brassard over the past year. They will no doubt soon be trading Matt Duchene, Mark Stone, and probably others. The Islanders, meanwhile, could be looking at the upcoming departures of players like Anders Lee, Brock Nelson and Jordan Eberle, all of whom are eligible for unrestricted free agent after this season. Before we get into the specifics of the Islanders and Senators, let’s try to take a quick look at how long it takes a team to recover from trading (or losing) a franchise player like one of these two. This is, quite admittedly, a rather anecdotal look at things (and some of these examples are of players that are even better than Karlsson and Tavares), but it can at least help us get some sort of idea as to what these teams might be in for. Perhaps the most famous example in the modern era was the Oilers trading Wayne Gretzky following the 1987-88 season, which also came just one year after they traded Coffey to the Penguins. This wasn’t necessarily a series of trades that were part of a rebuild, so the situations aren’t exactly parallels. It was more about, quite simply, money. But the Oilers were still a pretty fierce roster and not only made the playoffs for next four seasons, but won another Stanley Cup (their fifth in seven years) and went to two additional conference finals. Following the 2000-01 season, which saw them reach the Eastern Conference Final following the surprising mid-season return of Mario Lemieux, the Penguins dealt Jaromir Jagr to the Capitals for three draft picks. That kickstarted an all-out rebuild that saw them collect top draft picks for several years, setting the stage for what has become the current mini-dynasty era for the team. It took them four years to return to the playoffs following the trade of Jagr, as well as several other core players. That same offseason, the Flyers traded Eric Lindros for a similar package of players but never really missed a beat, making the playoffs for the next four years, reaching the conference finals once. Entering the 2005-06 season the Boston Bruins were a team that had qualified for the playoffs three years in a row, losing in the first-round each time, and decided after 23 disappointing games it was time to trade their best player, a still only 26-year-old Joe Thornton for Brad Stuart, Marco Sturm, and Wayne Primeau. The Bruins missed the playoffs that year and the following season before finally recovering in 2007-08. During the 2009-10 season, the Thrashers, knowing they could not re-sign Ilya Kovalchuk, traded him to the Devils, a move that came just a couple of years after trading Marian Hossa under similar circumstances. Neither return brought them significant pieces and the team was doomed to mediocrity for the next two seasons before things finally started to slowly but surely turn around following the relocation to Winnipeg. In 2013, the Devils went from Stanley Cup finalist just one year earlier to a team that would go on to miss the playoffs for five consecutive seasons after losing Parise and Kovalcuk in a one-year stretch. That playoff drought did not end until they stole an eventual MVP winner away from the Oilers. These are just a few examples, but unless it is a team that still has an otherwise loaded roster, you are probably looking at a few down seasons before returning to the playoffs following such a trade or free agency departure. Neither the Senators nor Islanders are returning a fully loaded roster and both seem destined for what are going to be very long seasons. The Islanders are constructed largely by fourth liners, a suspect defense and no clear-cut starting goaltender. The Senators look exactly the same, while both teams have multiple veterans that are prime trade candidates given their pending status as unrestricted free agents following this season. But just taking a quick look at both rosters and the assets they have, it should be crystal clear which one of these teams is starting their rebuild in a better position — the Islanders. What do they have going for them in their favor? For starters, a 20-year-old stud in Mathew Barzal who is not only the new franchise cornerstone, but is already better than just about any player currently on the Senators. As far as the NHL’s young stars are concerned, Barzal looks to be one of the brightest, following a rookie season that was one of the best in modern NHL history. He was legitimately great and brings a level of excitement to the rink when he has the puck that few other players can. When combined with Anthony Beauvillier, they had two players age 20 or younger score at least 20 goals this past season. The Islanders also have another outstanding prospect in Kieffer Bellows, whose pedigree and CHL production very much mirrors Barzal’s. And even though Bellows did not make the Islanders’ opening night roster, he was one of their best players in the preseason. Arguably their best player not named Barzal. They also had two of the top 12 picks in the 2018 draft and still own their own 2019 first-round pick. The Isles may not have a particularly good roster right now, but they at least some young building blocks and place and what could still be a legitimate shot at Jack Hughes in 2019. By comparison, the Senators have none of that. Their first-round pick for 2019, when the rebuild is really starting to get underway and the team is likely to finish with its worst record in quite some time, belongs to the Avalanche as part of the Matt Duchene trade from a year ago. And while it is certainly possible they can get a first-round pick or two back in one of their future trades this season, there is virtually no chance it will be a lottery pick. While having a top-two pick does not guarantee success, the teams that stripped down to the ground recently and rebuilt did so by collecting premium draft picks and using them to select franchise players at the top of the draft (Pittsburgh, Chicago, Washington all won Stanley Cups with multiple two-three picks over a multi-year stretch). Making matters worse, because the Senators have missed on so many of their recent first-round draft picks, the young players on the roster right now are not all that promising. They did not have a single player on the roster this past season under the age of 25 who scored more than 10 goals. Keep in mind again that the Islanders had two players age 20 or younger score at least 20 goals, and Bellows looks to be a better prospect than anybody the Senators have up front at the moment. After failing to get any of the Sharks’ best young players or prospects in exchange for Karlsson, their best young building block at the moment is probably 2018 No. 4 overall pick Brady Tkachuk, who, depending on who you ask or which scouting service you put your faith in, may have been a bit of an overdraft at that spot. Both of these teams are still probably a few years away from returning to the playoffs, let alone getting close to a Stanley Cup. But the Islanders, for all of their flaws and all of the questionable roster decisions they have made so far in the Lou Lamoriello-Barry Trotz era, still at least have a solid foundation on which to build. The Senators have nothing, and are probably going to miss out on their best chance at getting a franchise-altering player this upcoming June because they felt their 2017 was better than it was and just had to trade for Duchene. This rebuild is going to be extremely difficult. They just better hope they have the right people in the front office in charge of it because they have almost zero margin for error and some big trades and decisions still to be made over the next few months.